← Gift Cards now available! 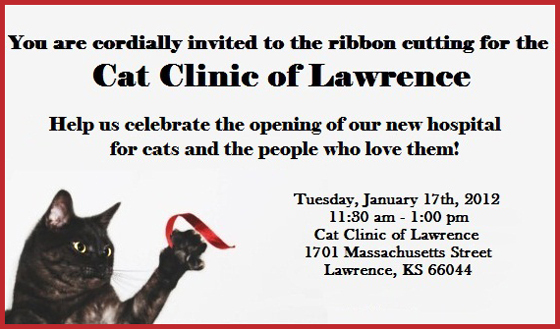 After lots of hard work, the Cat Clinic of Lawrence is ready for its first public event! We’d like to invite you to join us for our Ribbon Cutting Ceremony. The ceremony starts at 11:30 am. There will be a short welcome by George Paley, representing the Lawrence Chamber of Commerce, before Dr. O’Driscoll cuts the ribbon. Afterwards, refreshments will be provided, and you will be able to take a guided tour of our facility.